“Daddy, I really want a horsey. When can I get a horsey?” my daughter asked. “Well how much does a horse cost? Maybe we can find one on sale online?” she asked. “Ummm, yes I guess I am.” I answered after rolling the idea around in my head for a second. “A wind that is nice to people and tries to do the right thing?” I asked. “Enchanted wind maybe?” I asked. We celebrated My Six Year Old becoming My Seven Year Old with a trip to Disneyland. It was a fun trip for the whole family, and we made a lot of good memories, but for me one of the biggest, most impactful memories happened as we were getting ready to leave. 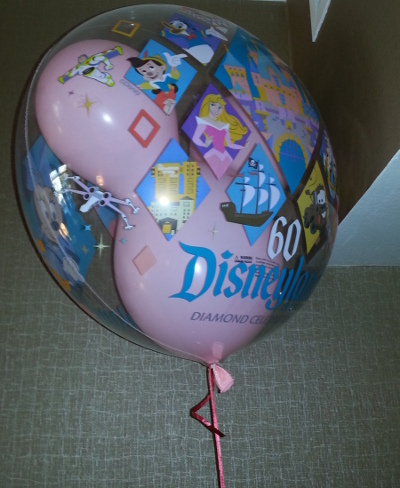 My daughter had begged me for a balloon, and I had put it off until the end of the day, as I didn’t want to carry a balloon all over the park, much less figure out what to do with it on rides. She had persisted, though, and she finally got her balloon. She loved the balloon and just gushed over it, talking about how cool it was that it was actually a balloon inside of a balloon, and playing with it all during the parade and fireworks show, and all the way back to the hotel. The next morning, though, as we were packing up and getting ready to leave the conversation came up that we couldn’t take the balloon on the plane. She was absolutely heartbroken. Real tears were being shed and my offer to deflate the balloon so we could take it home didn’t help any. The idea of DESTROYING the balloon (even a pinhole) was right out. So we finally decided the thing to do was to give the balloon away so some other child who would love it. We went down to breakfast, ordered food, and then left the rest of the family waiting for food to arrive while we went searching for a child. We had avoided the hotel gift shop. When my daughter had asked to go in there previously I had asked why in the world would we go into the hotel gift shop to buy random (non-Disney) stuff when we were at Disneyland and could buy Disney souvenirs that you can’t get anywhere else. Well it was about 6:30 a.m. as we had an early flight to catch, and there was only one child that we found that seemed to be the right age to appreciate the balloon. He was little boy, who looked to be around 3, with his mother in the gift shop. So we went into the gift shop and I talked to the mother for a minute to make sure they weren’t getting on a plane today too, and then nodded to my daughter. She stood up straight, squared her shoulders, looked at the balloon for a moment, and then puffed up her chest and offered it to the little boy. “Would you like this balloon?” she asked “It’s a really nice balloon. I think you’ll really enjoy having it.” The little boy’s face lit up and he took the balloon… and I started tearing up. The whole scene, watching my daughter prepare herself to give the balloon away, watching her talk up the balloon even as she was handing it over, was just too much for me. She looked at me, and both of us had tears in our eyes. And then she looked up at the top shelf along the wall, the one where they keep the ridiculously big toys in the gift shop that no one in their right mind actually buys, and her face lit up as she pointed. And that is how we ended up bringing home a rather large My Little Pony stuffed animal from Disneyland. “How much damage do you really think a little balloon could do to a great big T.V. ?” she asked. “Wouldn’t a unicorn with no horn just be a horse?” I asked her.